Cape Badge of Princess Christian's Army Nursing Reserve. "The centre shows a Geneva Cross, with four equal arms termination in a royal crown. Between each of the arms are shown some of the British emblems: top right facing as in medicine and heraldry* the rose that represents England; top left, the thistle of Scotland; lower right, the shamrock of Ireland; and lower left, an acorn with two oak leaves. The badge became obsolete in 1908." (22) * (i.e. 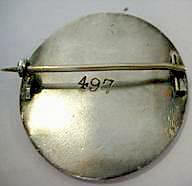 as if being worn on self). The age of probationers on appointment must be between 23 and 35. They must produce evidence of good health, moral character, and general fitness of disposition and temperament for the duties of a sick nurse. They must engage to serve at the hospital for a term of four years, three years as probationers, and one year (after obtaining their certificate) as Staff Nurses. The times for the commencement of the term of training are 1st February, 1st May, 1st August and 1st November, but no one can be appointed at those times unless she has previously been in the hospital on trial for at least a month. The hospital shall make the following quarterly payments; £2 during the first year, £3 during the second year, £5 during the third year, and £7 10s (£30 p.a.) during the fourth year. They must provide, at their own cost, all requisite uniform for wear during the time they are on trial for probationership. In the event of their being appointed probationers, after their period of trial, a certain supply of dresses, caps and aprons will be allowed them by the hospital during the remainder of their term of service. They will be required to wear this uniform at all times when they are in the hospital. They will be lodged and boarded within the hospital. At the end of their first year, they will be required to pass an examination in the subjects covered in the year. If they pass the examination, and are otherwise efficient, they will be employed as Staff Probationers for the remainder of the three years. During the second and third year of training, they will receive lectures in medical and surgical nursing from members of the hospital staff. At the end of the third year, they will be examined on their knowledge of nursing. They will be subject to dismissal at any time for misconduct, inefficiency or repeated neglect of duty. Failure to pass the examination at the end of the first year will be considered a sufficient cause for the termination of a probationer's contract. At the end of the third year, a certificate of competency as nurses will be awarded to those who, besides having discharged their ward duties efficiently, have passed both examinations and conducted themselves in all respects to the satisfaction of the hospital authorities. At the end of a year after obtaining their certificate, they will be free to quit the hospital. By arrangement, they may remain in the service of the hospital as Staff Nurses after that time; and they will be paid £35 p.a. for the first year, and £40 p.a. subsequently. upon the part of the public as to why this should be the case, and it is 'apt to assume, in most instances quite incorrectly, that the over severity of the discipline enforced in hospitals and institutions is the cause of such rash actions. Thus in the recent case of the suicide of a probationer at the Carshalton Cottage Hospital, it was reported that she took her life by drinking strychnine after being reprimanded by the Matron for a slight fault. Many people would draw the conclusion that the reprimand was over severe, but the evidence at the inquest showed that the Matron, Miss Rose B. Mustard, was both kind and gentle, and that the deceased probationer was of a very passionate nature and violent temper and resented being told, even gently, of any small failing. Dr. Cressy, Medical Officer to the Hospital, stated also that she was neurotic. This brings out a point to which we are of opinion, too little consideration is given in the selection of probationers, namely, that of temperament. Approximately six reports were found in the nursing press between 1894-1907which suggested that suicide among nurses was a frequent occurrence. Suicide was generally by some form of poisoning; strychnine, nitric acid and phenic acid with drowning also mentioned. Most reports from inquests reported that the nurses were mentally unstable (volatile temperament and religious fervour were given as causes). It was generally felt that more thorough nurse recruitment was the best method of reducing the risk of unsuitable candidates becoming nurses. However, Dr S. Kelly, in a report on suicide for the ONS in 1998, said nurses did have high suicide rates but it was not as high as four times the population. "I can't support that at all," she said. In the general female population aged over 15, the suicide rate was 5.6 per 100,000, higher than the three per 100,000 cited by the Liberal Democrats. The ONS report found that, nurses had a suicide rate 37 per cent above that of the population between 1991 and 1996. Three weeks later probate of Helen's estate is granted to her daughter Florence, to a value of £4,448(4) (approx £250,000 today). (9) It appears unlikely that Helen’s death was caused by financial hardship- perhaps she drank from the wrong bottle by mistake? Alternatively, perhaps she was suffering from severe pressure as a nurse -although so far we have no evidence of her having any formal training as a nurse. Helen was on Jersey in 1861 as a 20-year-old scholar, and married Joseph in1867. She could perhaps also have trained between 1881-1899, but is living on her own means in the 1891 census. (A relative of mine was shown as being both a hospital nurse and living on her own means on the 1911 census). Perhaps Helen was about to lose her job as Matron as she was not trained? Nursing records for the Hospitals on Jersey exist from1920. *E.C. Puddicombe is listed- however this is a typing/printing error as there are no other Puddicombe's listed among the St Bartholomew's League of Nurses Archives from 1900-1945. (26) Florence is among the inaugural members listed in the first League newsletter. 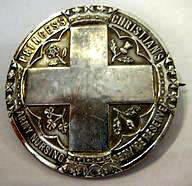 Of 400 certificated nurses invited to join the league in 1900, by 4th December 1900, 247 had joined. Florence's address is listed in every league Magazine from 1900-1945, when her death is announced. In 1900 and 1901, Florence's address is 7 Springfield Crescent, Jersey (31) the road in which her mother lived when she committed suicide. The Hospital coat of arms gave inspiration for the badge, which is shown in the stained glass in the hospital chapel. Stained Glass Window in the Hospital Church of St Bartholomew the Less: with coat of arms beneath. Within one year of her mother's apparent suicide Florence signed up on 28th March 1900 to become a member of the Princess Christian's Army Nursing Reserve. Princess Christian (Queen Victoria's third daughter) established the Princess Christian's Army Nursing reserve in 1897. Princess Christian's Army Nursing Reserve worked alongside the Army Nursing Service which was formed in 1881(but initially had only very few nurses - approximately 20). Princess Christian's Army Nursing Reserve was merged into Queen Alexandra's Imperial Military Nursing Service (established in 1902) in 1907. Her short service history is transcribed on www.boerwarnurses.com (2) and she appears to have worked at No 5 General Hospital, Wynberg, and No. 15 Stationary Hospital, Heidelburg. Her league address in 1902 is also No. 15 stationary Hospital, Heidelburg (30). Unlike other league members Florence is not listed among the St .Bartholomew's nursing staff that had gone to South Africa to nurse during the Boer war; presumably, as she had left the hospital in the intervening five year period. This was the Royal Victoria Military Hospital, built near Southampton water, Southampton. "The Junior House, Felstead School, Essex; Matron, Felstead School; and then the Infirmary, Felstead, Essex." (33) These are interpreted to all be at Felstead School as Florence is working in Felstead School, Essex as a sick nurse on the 1911cenus (4). Her address remains the same until 1920. (I have emailed school to see if any records survive). Among Florence's war records at Kew, (1) is her contract with the War Department signed by herself on 5th August 1914 and a contract extension signed on 9th May 1917, as a Sister in Queen Alexandra's Imperial Military Nursing Service Reserve. Florence spent 14 days in the Convalescent Hospital-Hotel de L'Esterel in Cannes in December 1917. This had 100 beds and nurses and VAD's (Voluntary Aid Detachment workers) could apply to spend their leave there, in the relative warmth of the South of France rather than returning to England for their leave. (20) Despite reports in memoirs of leave being curtailed during the war she also received four other periods of leave, each for 14 days, at least two of which were spent in England. In 1919 prior to the "dispensing of her services," Florence was working in Bonn with the British Army of the Rhine (at 21 Casualty Clearing Station). Her report, written by the current Matron shortly before her departure states (following strict directions from the Kings regulations). Florence's service officially ended on 24th August 1919. On landing in Folkestone she signed the dispersal certificate on 16th August 1919 and gave her address as St Stephens Vicarage, Launceston, where her 1st cousin Rev E. Drewe was living (4). Throughout the war, he was also recorded as her next of kin on official documentation. Florence applied to the War Office for a gratuity, which was successfully awarded (with a note that she was not insured), on 28th August 1919. Florence also received the Victory Medal, British Medal and 1914 Star, the latter, as she was part of the original British Expeditionary Force in France from the outbreak of WW1 in 1914. This confirms that she dies in Reading in1943, with her death registered in the December quarter. Probate was granted to Florence's first cousins son, Arthur Seymour Drewe MC, who also lived in Reading. (4) Probate was granted in Llandudno with Florence's address given as nursing home in Bath-this seems contraindicated by this death announcement, which presumably would have been verified with relatives before being printed. If Florence had a League badge, was it engraved and if so where is it, and where are her medals? Will Burgess, for editing, encouragement and uploading (S.o.N). The archivists at St Bartholomew's Hospital Archives. Keiron at Boerwarnurses.com. Peter for extra back ground research and lastly but not least for proof reading, my very supportive husband, Harry. 22. Meglaughlin, Jennifer. 1990.British Nursing Badges, An Illustrated Handbook. 1st Edition, London, The Vade-Mecum Press Ltd.
24. The Independent, 28 SEPTEMBER 2000, Nick Harvey, Liberal Democrat spokesperson. Experiences at a Base Hospital in France 1914-1915, London: John Bale. 55-56. 25. The Registrar General of Births, Deaths and Marriages in England (and Wales): Sixty-Second Annual Report; 1899. Fig 1& 2. COPYRIGHT; Sarah Rogers.